The announcement that the federal government is finally engaged in genuine negotiations with the province to hand over a hotly-contested property in downtown Fort McMurray is wonderful news indeed - although I must admit I have some further thoughts about this entire process, how long it has taken and appropriate compensation for our community to make up for that delay. Willow Square has been the property promised to the senior citizens of our region for a very long time. The twists and turns in the story are well known, with delays being seen at almost every corner and several recalcitrant levels of government showing that working together is not exactly one of their strengths and seeming instead to be working against each other. This week it was revealed that the federal government is negotiating with the province to purchase the land, but not for some sort of deal that will make those long delays - most of them at the hands of the federal government who were unwilling to budge on certain aspects of the deal - more palatable. No, they still want to get lots of cash for the land, cash from the province that comes from all of us and that once again sees money simply being transferred between levels of government and right out of our community and into Ottawa. Now never mind that this piece of property has been sitting idle for some time. By now we could have probably established squatter's rights, claiming ownership due to the pure neglect of the owners to do anything with it. Never mind that it sits squarely in the middle of downtown, right across from the hospital and while it might belong to the feds should clearly already belong to the people of this region. Never mind that the federal government has scarcely lifted a finger to help us acquire this land and move ahead with the proposed aging-in-place facility, instead throwing up roadblocks as if this was some sort of game to keep us from getting what we want. No, never mind all of that, now they want their pound of flesh from the province. This week RMWB Councillor Guy Boutilier suggested that this land should be transferred from the federal government to the province for the sum of not more than $1. I completely agree with this assessment, as I have grown weary of watching money continuing to flow out of this region and very little flowing back into it. Perhaps if the federal government agreed to this generous exchange that would benefit our community the province could then take the funds allocated for the land purchase and instead build the very facility the senior citizens in our region have been requesting not for months or years but decades. Perhaps, for once, the governments that serve us could actually work for us in this region and not against us and make it easier for us to get what we want, need and deserve as opposed to making us fight for every last crumb. The fact that we have no long-term care facility, no aging-in-place facility and no continuing care other than a ward at the hospital is a travesty in my opinion. As someone who cared for their aging parents I know how these facilities matter as our treasured seniors grow older, and I know how vital it is to have these services available for some of the most vulnerable in our society. These facilities are not a luxury or a "nice to have item" - they are a stone-cold need to protect and care for those we love. Do I truly believe the federal government will heed the suggestion from Councillor Boutilier? Likely not, although I would very much like to see that case stated directly to Minister Kenney from members of our council like Mr. Boutilier as perhaps they could impress upon him the hardship and turmoil this issue has created in this region - and the level of distrust and lack of faith it has engendered in our federal government. I would suggest a one dollar purchase price for Willow Square would go a long way towards rebuilding some of that faith, as well as opening the doors to talks with the province about how they could send the money allocated for the land our way to build the facility instead. It would be nice to see some cash flowing into Wood Buffalo instead of the other way for once, but I suppose you could call me a dreamer since that seems more like dream than reality if the current pattern of money distribution holds true. Hell, I am so much of a dreamer that I would be quite happy to give them the loonie to just get this deal done and have Willow Square's ownership right where it belongs - with the people of Wood Buffalo. 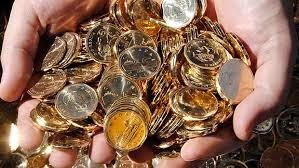 And I am quite certain I am not the only one who would be standing there with a loonie in hand, ready to buy what rightfully should be ours already. For just one dollar the federal government could show their belief in the value and importance of this region, and their regret over the long delays that have been so very stressful and painful for so very many - but I suspect it is a simply a one-dollar deal they would never accept. And what a shame that is, because it is the one-dollar deal that could change history and the narrative of life in Fort McMurray.